Because hot mix asphalt must be delivered at precise temperatures, truck drivers are the backbone of every paving project. 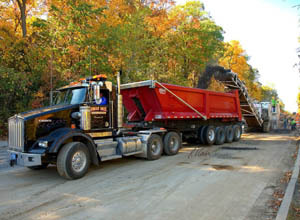 Truck drivers load the asphalt into hauling units and safely drive from the plant to the work site. Reliable delivery keeps road construction on time and on budget. NOTE that drivers are typically subcontractors — most paving companies employ few drivers directly. You should seek work from a driving company if you’re interested in this work.